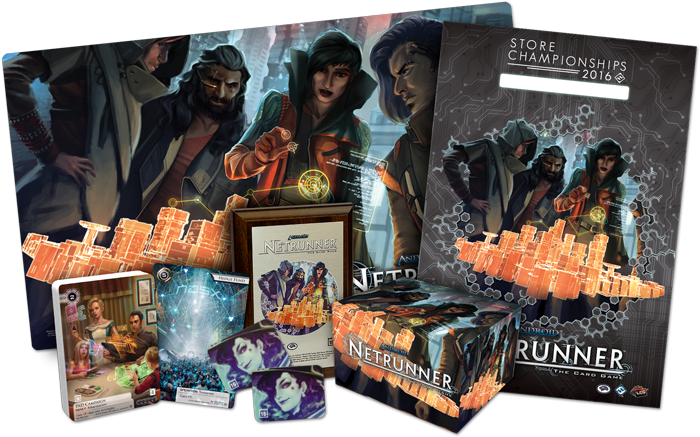 Join us for our 2016 Android: Netrunner Store Championships! Time: Registration begins at 11AM and the event will begin at Noon. Top 32 – The top thirty-two players will each receive a copy of the alternate art card “Pad Campaign” – an easy, hands-off investment that can pay for itself…If you can protect it. Top 8 – The top eight players will each receive a deckbox to hold your assets and hardware in. Top 4 – The top four players will each receive a playmat depicting some Anarchs ready to run amok. Top 2 – The top two players will each receive a printed acrylic token to be used with the card “Femme Fatale”. First Place – The winner will receive a color printed plaque and a first round bye (not pictured) to a 2017 Android: Netrunner Regional Championship of their choice! Additional prizes will be awarded in the form of store credit based on total event attendance.